Sharp's 108" TV hits Britain - will it ever be superseded? TechRadar was invited to the Visual Innovations showcase last night in London where we treated to some big-screen delights. Organised by TV distribution specialist PSCo, the company took over a wing of Imperial College London to showcase some behemoths of the telly world. It was here that Sharp's 108-inch television finally made its UK debut, after it was announced way back in CES 2007, shown off again at IFA 2008 and even made an appearance at CES 2009. Alongside Sharp's flagship LCD – which is 1080p Full HD – was Panasonic's 103-inch touchscreen plasma. Well, it is touchscreen if you add a touch-sensitive panel overlay to the screen, which PSCo had done. These TVs aren't really built for the consumer market. When TechRadar spoke to the people at PSCo assured us that they were being used more and more in a commercial environment, such as airports and the like. They did inform us that the Sharp screen was being used in a cinema foyer in Japan. To be honest, the screen is so big it could be used for the cinema itself. 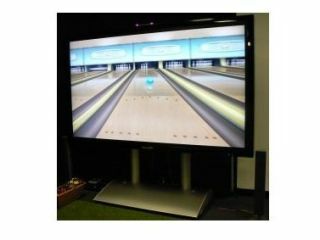 In recent years, LCD panel makers have certainly started to match and even exceed plasma as the big-screen of choice for consumers, but the folks at PSCo believe that the end may be in sight for mega-screen TVs – not in terms of production but size. One spokesperson said that he felt 108 inches may well be the maximum size for LCD, not because of technological limitations but consumer desire. Why make them bigger if there is no real use for them when they are too big? Saying that, we are sure there are a few footballers out there looking for a TV to match the size of their mansion. Read more about the Sharp and Panasonic offerings at HomeCinemaChoice.com, where they also have a little tidbit about the future of 3DTV in the home.